one of National Geographic Traveler Magazine’s “Best of the World 2012” recommended places to visit. TreeTops ownership comes with an exclusive Clublink membership, and many choices. Enjoy the impressive Clubhouse at Grandview embodying the Muskoka grandeur with its stunning patio overlooking the first Tee. The Mark O’Meara Course at Grandview Grandview – winding its way through the granite, forest and wetlands of the incomparable Muskoka region, and with tees ranging from 7,065 yards to 4,750, Grandview is a delight to play. The course, site of the 2002 Telus Skins Game won by Sergio Garcia over Vijay Singh, John Daly and Mike Weir, and the 2002 Canadian Tour Ontario Open, is accentuated by its stunning clubhouse, and a nine‑hole Academy Course. Other superb Clublink courses in the area Lake Joseph Club and Rocky Crest Golf Club can be golfed under your owner’s entitlements. Within a short drive of your TreeTops home, many other golf courses can be booked directly with the operator on a pay‑as‑you‑play basis, including the Huntsville Downs Golf Club, Whispering Pines Golf Course and others. Also next door, Deerhurst Resort also boasts two 18‑hole golf courses which can be booked directly. Embracing Peninsula Lake and visible from TreeTops, the Par 64 Lakeside Golf Course is beautifully laid out at 4,569 yards, providing a compact yet challenging game for pro’s, amateurs and everyone in‑between. With deep bunkers, undulating greens and tight fairways, your skills will be called on with every hole. One of Muskoka’s first and best courses, Deerhurst’s Highlands Course is a par 72 that stretches over 7,000 yards, with six tee decks, allowing this championship‑calibre course to be enjoyed by all players, of all skill levels. Viewed as a “must‑play” by anyone familiar with cottage country and named ScoreGolf’s Best Resort Course in Ontario (2011). Club Leisure has worked together with the Muskoka Ski Club at Hidden Valley Highlands Ski Area to put together a special membership package exclusively for residents of TreeTops. The Hidden Valley Highlands Ski Area is one of Ontario’s oldest and most established ski areas. Included in the 120 acres of property are 35 established acres of downhill skiing and snowboarding trails, along with 450 feet of beach frontage on beautiful Peninsula Lake. The Ski Area offers 14 groomed trails ranging from Beginner Hill to the black diamond Face, with trails suitable for all ages and abilities. There are three quad chairlifts, a handle tow, two snow cats, night skiing and snowboarding, and a Terrain Park. The Muskoka Ski Club has also invested in a completely redesigned and updated snowmaking system and equipment to maximize the length of the ski season and ensure that the Muskoka Ski Club can deal with our new climate in the Near North. All owners are required to pay annual club dues and applicable capital assessments as part of the monthly condominium fees. E. & O.E. Prefer cross‑country skiing? The opportunities are endless in Muskoka, with trails at TreeTops and the Muskoka Ski Club, and extending throughout the area, including endless trails local parks including Algonquin and Arrowhead Provincial Parks. The water is the place to be in Ontario’s famed ‘cottage country, and there is no lack of water activities available on Peninsula Lake, just a few moments from your TreeTops home. Both Muskoka Ski Club and Deerhurst Resort have extensive shoreline on Peninsula Lake, and offer a variety of waterfront fun. Owners may access these amenities, whether through owner’s permanent entitlements at Muskoka Ski Club, or through membership packages at Deerhurst purchased directly. Deerhurst features a beautiful sandy beach with chaise lounges, as well as an indoor swimming pool with a whirlpool and children’s wading pool, and an outdoor splash pad. If you prefer to remain dry and take life at a more leisurely pace, you can take a peaceful guided tour of scenic Peninsula Lake, Fairy Lake and the historic canal that joins the two. There’s no better way to explore the beauty and majesty of Muskoka than on your own two feet – whether you’re hiking, jogging or turning the pedals of your mountain bike! Huntsville has a great system of trails and parks which showcases the area’s beautiful surroundings. There are a half dozen major trails with access points near the centre of downtown Huntsville and your TreeTops home. Offering a “moderate” difficulty level, the 3.4km Fairy Vista Trail is an all‑season trail travelling through fields, forests and wetlands. It is paved for all types of recreational activity with the exception of motorized vehicles. The 3.8km Hunters Bay Trail is also “moderate” in difficulty — a walking, running and cycling trail that winds along the river, under the railway trestle, along the south side of Hunters Bay, through the Avery Beach Park. With multiple entry points, the 52km Trans Canada Trail is ranked easy to moderate, depending on where you access it. With a variety of pedestrians and vehicles sharing the road, the trail winds through the woods and along Hunters Bay on a natural service, and on a series of secondary roads and town streets, both paved and gravel. With an intermediate level of difficulty, the 1.5km Yonge Street Trail is a natural ground trail through mature forest that takes about 30 minutes to walk or 10 minutes to cycle. Also intermediate is the 1.3km Lions Lookout Trailwhich runs along the Muskoka River to Fairy Lake, crosses the Portage Flyer railway tracks, and heads up a steep slope to the top of the sports track for a magnificent view of the lake. There is no where to hide from the multitude of lakes in Muskoka. As an owner, you will enjoy the private beach at TreeTops at Hidden Valley on Peninsula Lake, with boat slips and facilities for launching.You can also discover many of the beaches and lakes as well as the endless opportunities for swimming in the clear lakes of Algonquin Provincial Park and the sandy beaches of Arrowhead. Muskoka is a major destination for Ontario’s snowmobilers. With 2,000 km of uncrowded, groomed trails, you can go deep into the heart of cottage country. Whether you enjoy sledding the occasional weekend or all winter long, you’ll love exploring the countryside surround TreeTops. So suit up, grab your goggles, and bring along a thermos of hot coffee as you and your friends set out to tackle the snow head‑on! Huntsville’s historic Town centre is surrounded by large rural areas of forest, wetlands and over 140 lakes, including Hidden Valley. There are dozens of parks within minutes of the TreeTops site, many with beach or water access. But that’s just the beginning. Just north of Treetops is the world famous Algonquin Provincial Park, the first provincial park in Ontario and one of its largest. 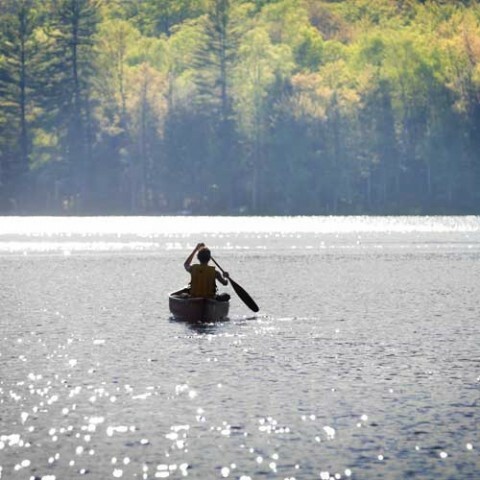 Algonquin is not just one of the country’s biggest camping destination, it also offer a diverse range of natural, cultural, and recreational programs and attractions for day visitors. So take your canoe out for a great day of paddling. Arrowhead Provincial Park is also nearby. Like Algonuin, it too offers a variety of four‑season programs and things to do. One of the most is the park’s unique Night Skating where you can skate along the unique 1.3km Ice Skating Trail through a wooded winter wonderland. Boating opportunities also abound, not only on Peninsula Lake but also nearby where one can explore Fairy Lake, Lake of Bays, Lake Joseph and Lake Rosseau. Lake Trout. Smallmouth and Largemouth Bass. Rock Bass. Northern Pike. Sunfish. Perch and more. The over 1,600 lakes in Muskoka are full of some of the best freshwater game fish around. 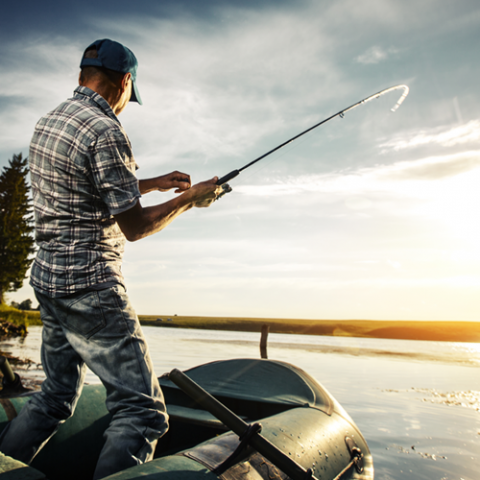 There are choice fishing spots all around Huntsville in particular, including islands, bays, points, shoals and other water features where the fish tend to congregate. TreeTops owner can fish from boats or from shore, and on lakes as well as hundreds of rivers, creeks and streams. Those anglers with their own boat can use the boat launch at Hidden Valley, or moor it at the Deerhurst Marina. In addition, you can get a group together for fishing charters and excursions that can be booked through Deerhurst, from May to late fall.